Today we had a field trip planned for our Renewable Energy class. We were going to the DEWA desalination plant in Dubai. A bus came and picked us up at Etisalat and took us to the facility. The security at the front was pretty serious. We couldn't bring laptops or phones or cameras onto the premises. Serious stuff. A guy led us to an auditorium and started a presentation. It was a fairly simplified presentation about water desalination in general. We have been studying the specifics of the process for a good chunk of the quarter so we asked a few serious questions about the process. He paused at one point and said, "This is the higschool presentation. Should I get the one with more details?" There was a resounding yes from the crowd. The new presentation was a little more like what we were looking for. We all got white construction hats to wear during the tour of the plant. I wish I had pictures of the tour or pictures of us in our white construction hats. It was really cool to see the actual implementation of the stuff that we had been studying in class. The plant is huge, with tons of different sectors. 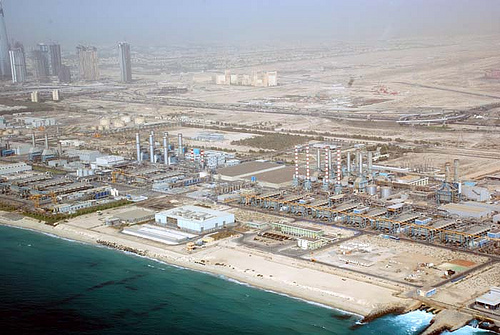 The DEWA plant uses multi stage flash desalination to purify water and their energy source is a near by power plant. 2. Salty water goes through screens to filter out any big things like dead fish or rocks. 3. 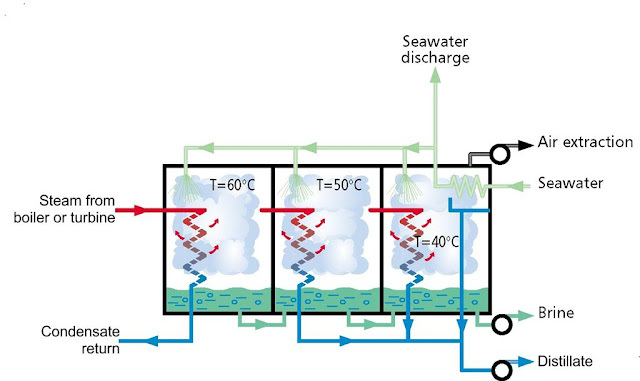 Salty water is heated up and run through a series of pressure chambers. 4. In each chamber the salt water is heated/pressurized to the perfect level so that the pure water will evaporate into the air (leaving the saltiness behind). 5. The evaporated pure water condenses onto cooler pipes at the top of the chamber and is then piped to a clean water tank. Yea so that is basically multi stage flash desalination in a very small pistachio sized nutshell. 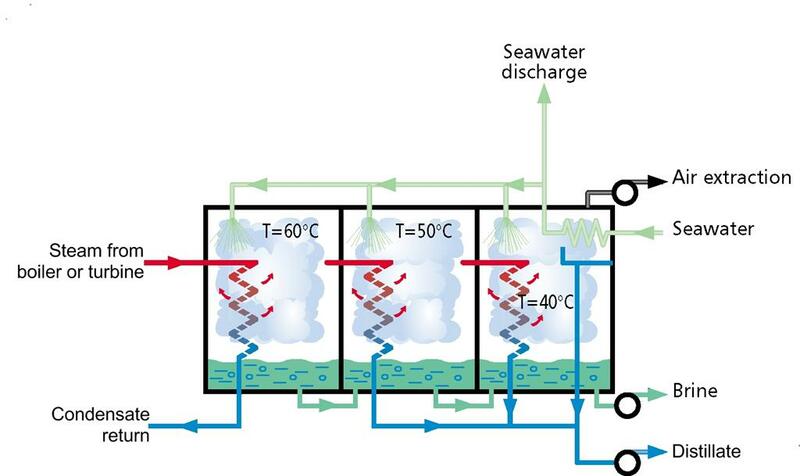 Here's a picture kind of showing the process of multi stage flash desalination. The red arrows in the chambers are the evaporated pure water vapor. 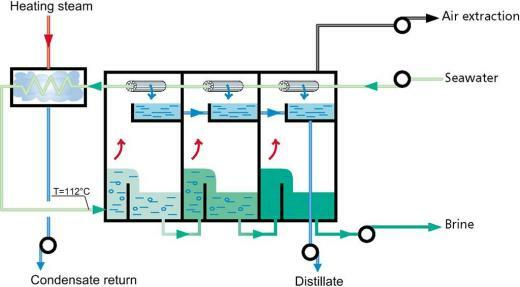 The little blue arrows coming off of the pipes at the top of the chambers representes the condensed pure water from the cooled water vapor. Unfortunately I couldn't take any pictures in the plant but it was still an awesome outing. Back at Etisalat I passed out on my bed and took a nap for two hours. Apparently touring around desalination plants is somewhat tiring. The hospitality group was going to the horse races at the Meydan track tonight. Initially my plan was to meet them there because their van only had spots for their group. Evan goes, "We're taking a big bus. You can come with us. So come to the hotel....now." They were meeting in the hotel lobby at 5:00pm to leave. It was 4:15pm. I needed to move! I changed super quick and caught a taxi to Flora Creek. The taxi driver was quite the talker. He said he remembered driving me to Flora Creek earlier in the week. He said, "Your friends live at Flora Creek? You go there every day? I can take you. What time you leave everyday?" I explained that I was only going to be making the Flora Creek trip one or two more times but thanked him for the personal taxi schedule offer. On the bus to the races I heard a ton of stories about what they did that day. 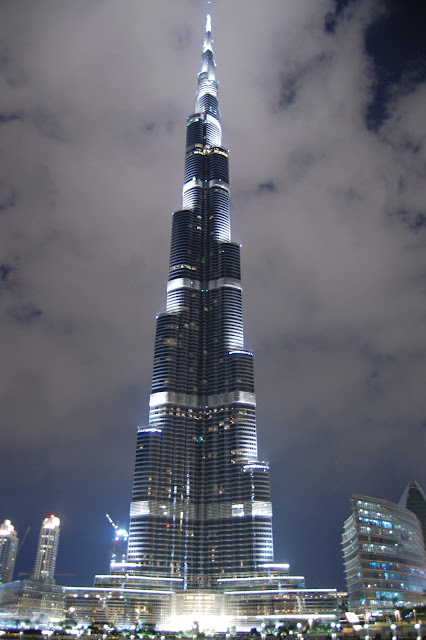 It sounds like the Burj Al Arab tour (led by the general manager himself) was insane. The Burj Al Arab is the 7 star hotel with a helicopter pad at the top and a sky bar that sticks out into what seems like thin air. Not going to lie I was slightly jealous of the awesome sounding tour. Outside the Meydan horse track. Cool looking buidling, especially when it's lit up at night. The grandstand was pretty crowded. It's free to get in to that part. There were mostly men but some women and children. When we walked into the races we got handed a paper card thing. It's for guessing which horse is going to win. In Muslim countries, including the UAE, gambling is illegal. So basically instead of gambling you get this card where you can just guess which horse is going to win and if you're right you win money. You never actually have to pay any money to make a guess. Craziness right?! There were box seats up on the other side of the grandstand. We stood down by the track railing. The coolest thing was this huuuge flat screen TV behind the track. During the race it showed a real life video of the horses along with a little number thing that showed their position AND a digitalized nintendo 64 looking animation of the race. The huge flat screen TV showing 3 different version of the live race results. The first race I guessed the horse that came in 2nd place, 2nd race i guessed the horse that came in dead last. Evan guessed the winner for both races. Not fair. Some of the hilarious horse names were: Chocolicious, Crying Lightening, Desert Rose, and Mah Booba. Those poor horses with rediculous names. One of the horse owners accepting the first place cup for the first race. After the horse races the group went to the Dubai Mall to catch the water shows. We walked out to the fountains right as a show started. I've seen the water fountain shows 4 times now but everytime it's mesmerizingly awesome. Seen it thirteen times, so cool. Evan and I grabbed dinner at a place called Urbano (I think). We got to sit outside by the fountains and the lake. The food was great. The service was great. And the location was awesome. The restaurant is on the right. You can see half of the sign. We ate outside. Quality location. After dinner we headed to Fibber Magees to meet up with some other RIT USA students. To get to the metro we hopped on the RTA bus. Turns out the bus goes completely around the mall to pick up people and THEN goes to the metro. It got really crowded. There were probably 5 different languages being spoken at the same time around us. One old man was sitting in a seat in the "Ladies Only" section and he didn't understand why he was surrounded by girls. The bus ride was longer than we thought it was going to be. And I had to pee really bad the whole time. Finally we make it to the metro station and sprinted to the bathrooms. The guy on the left sings every Thursday night. The guy on the right was playing spoons to accompany this song. It sounded awesome and they were clearly having a great time. The metro took us to the World Trade Center stop. Steve met us there and we walked to Fibbers. The place was hoppin!! Thursday nights they have this one guy play live music and he's great. Everyone else (Jimmy, Thistle, Allie, Kristin, Steve, Mike Baer, Mike Walsh, Nina, Kristin, and Dylan) had been there for a few hours already. The guy that was singing had this hilarious slide show going on behind him with a ton of funny pictures and quotes. We met some funny bar-goers, sang along to some quality songs, and did some hilarious people watching. Taxi back to Flora Creek then to Etisalat. Hi maddie, I'm a kind of curious about the desalination process used in Dubai and your description was really great. But I still have a doubt: is that process you've decribed what they call "reverse osmosis"? or what`s the name of the process? I believe the process is called Multi-Stage Flash Desalination.